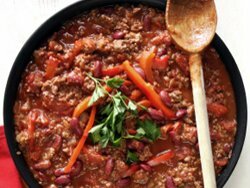 My chili con carne recipe makes a generous amount of about 12 cups. Which is great for freezing in 2 or 3 cup size containers. Use in such recipes as Burritos and Taco Salad. Wash and sort beans. Soak overnight in water in a large saucepan. Next morning bring to boiling and simmer covered for 1 hour, stirring occasionally. Brown meat in a large pot. Add onion, garlic and green pepper. Drain fat from pot and add tomatoes including liquid, paste, broth, chile powder, cumin, oregano and salt. Stir breaking up tomatoes with wooden spoon, bring to a boil. Cover, reduce heat to simmer for one hour, stir occasionally and check that is is not sticking to the bottom. Add beans and 2 1/2 cups of the cooking liquid to the meat mixture. Stir, cover and simmer for 2 to 3 hours stirring occasionally until flavors are fully developed, sauce is thickened and beans are tender but not mushy. Serve chili con carne with corn chips and garnish with red pepper strips and sprig of parsely. I will also have on the side a bowl of chopped onion, grated yellow cheese, chopped jalapena peppers and sour cream to name a few.